It has been suggested that Tannochside be merged into this article. (Discuss) Proposed since January 2018. 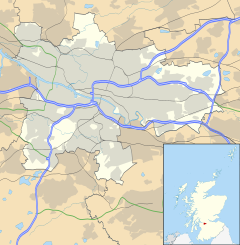 Viewpark is a settlement in North Lanarkshire, Scotland. Situated immediately north-east of Uddingston, Viewpark is adjacent to Tannochside, and is 2 kilometres (1.2 mi) west of Bellshill. It has an estimated population of 13,916. Viewpark was originally built to house miners and was erected quickly. Construction work on "The Scheme" starting late 1950s and with houses down to Laburnum Road being occupied around the beginning of the 1960s. These supplement housing built adjacent and parallel to the "Top Road" - the Old Edinburgh Road where could be found the Police Station (whose siren continued to sound practice air raid warning into the 1960s) alongside the local football ground and opposite The Royal Oak Bar. Dominic's Shop (now long closed) alongside "The Lane" allowing quick access to the adjoining community and the local swing park on Douglas Street - named for the association with the Douglas (Home?) estate the houses were built upon.[when?]. The older houses were originally called "The Raws". Viewpark grew steadily at this time to support housing demand in an area which was thriving at the time with industries such as Mining and Ranco and the Caterpillar Tractor Co which opened its doors in 1959 thus creating a boom in the population of the area which is known today as Viewpark. 1956 and the main thoroughfare in Viewpark, Laburnum Road, often referred to as "The Burma Road", in reference to its length, was well underway in its construction. That same year, the local council set up what has now become Burnhead Bowling Club, along with an adjacent tennis court. A new church was built, Burnhead Parish Church, on Laburnum Road, opposite its junction with Burnhead Street. Located near the older housing within Viewpark is the Glen, also known locally as the "Viewpark Glen" which expands across Uddingston, Bothwell, Hamilton, Coatbridge and Motherwell. Within the Glen lies famous Roman ruins such as a Roman bridge as well as tombs dating back centuries further. The demolition of the miners homes, referred to as The Miners Rows, in Tannochside, which released land for the erection of the Caterpillar Tractor Co. led to an influx of displaced families into the Viewpark area. A similar fate befell the Miners Rows at Cockhill, located due east of Laburnum Road. That land has now been utilised as a football field, with a shopping area on the north side of Old Edinburgh Road. Kerrs Farm at Cockhill, also disappeared, and that land, which extended between Laburnum Road and the new bypass road, the A725, was used to create Righead Industrial Estate. A shopping complex was added in the centre of the new housing complex, aptly located in Market Place, just off Burnhead Street, opposite the old rose gardens (now long gone) - now replaced by the Community Centre, a Sports Complex, and a Medical Centre. This being immediately opposite the Gala Day Park where the local Miners Welfare would organise their annual MayDay celebration where each child was presented with a Tunnock's Box of cakes and fancies after competing in games and races. That park is still there. Viewpark is one of the few villages in North Lanarkshire still to hold a Galaday each summer. St Columba's Primary School was on Old Edinburgh Road. The original wooden structure was demolished after fire damage in the early 1960s. The replacement school building has since been knocked down and replaced by private housing. St Catherine's Junior Secondary was built at the corner of Laburnum Road and New Edinburgh Road. It opened in the late 1960s after campaigning by local activists whose children had previously had to travel to Uddingston or Motherwell for secondary education. St John Paul II Primary school, which sits on the corner of Laburnum Road and Old Edinburgh Road, was created as a result of the amalgamation of St Columba's and St Gabriel's primary schools in May 2006. Tannochside Primary School and Nursery Class was opened on the 23rd August 2006 and was the amalgamation of the old Tannochside Primary and Burnhead Primary and it is situated on Douglas Street, at the end of Burnhead Street. Thorniewood United, a Scottish Junior Football Association club playing in the West Region, is based in the area as well as Viewpark United, an amateur football league team playing in the Airdrie & Coatbridge Sunday AFL Premier Division. Margaret, Duchess of Douglas, was daughter of James Douglas of Mains (12th) and obtained her title by marriage to Archibald Douglas, 1st Duke of Douglas (part of the Red Douglas family, and a distant relation). Margaret and Archibald married late in life, did not have children, and the title of Duke of Douglas became extinct on Archibald's death. The estates of Douglas became the subject of a legal battle (known as the Douglas Cause) between Archibald Steuart (the Duke of Douglas' nephew) and the Duke of Hamilton, who inherited the remaining titles of Douglas. Margaret supported Archibald, who was granted the estates after appeal to the House of Lords. In her will, she left money to purchase lands to be called Douglas-Support. Sir James Hamilton, 2nd Baronet purchased Douglas Support in 1691 from Sir Archibald Hamilton, 1st Baronet and had plans drawn up for Rosehall Estate in the grounds of the area now known as Douglas Support, where he would live with his wife, Frances. He died childless on 15 March 1750 and the estate and baronetcy passed to his brother Hugh, who died unmarried in 1755. The title became extinct and Rosehall passed first to Hamilton’s half-sister, Margaret, and thereafter to her eldest son, Archibald Hamilton of Dalzell. In 1851, General Sir Thomas Monteath Douglas In 1851, succeeded to the estate of Douglas Support under the entail of the Duchess of Douglas, and took the name Douglas in addition to his own. He never returned to India, but was promoted in due course to be major-general on 20 June 1854, lieutenant-general on 18 March 1856, and full general on 9 April 1865. In March 1865 he was made a Knight Commander of the Order of the Bath in recognition of his long services during the early years of the century. He died at Stonebyres in Lanarkshire in October 1868. Footballer Jimmy Johnstone, affectionately known as 'Jinky', played for Celtic and the Scotland national team and was born and lived in Viewpark throughout his life. A memorial garden containing a statue of Johnstonw was opened in 2011 in the grounds of the former St. Columba's Primary School, which he attended. Kevin Budinauckas, goalkeeper who has played for Stenhousemuir, Partick Thistle, Clyde, Brechin City on loan and Stranraer in the senior game. He also had a couple of spells in junior football at Wishaw and Linlithgow Rose, Cumnock, Pollok and Armadale. Entrepreneur, musician and author Chic McSherry grew up in Viewpark. He was awarded Officer Of the Order of the British Empire (OBE) in the Queen's Birthday Honours List in 2018. ^ "North Lanarkshire Electoral Ward - Thorniewood - Ward 14". Scottish Government Statistics Website. Retrieved 15 November 2018. ^ "Archaeological Site Distribution Maps from ARCHI UK". ARCHI UK. Retrieved 15 November 2018. ^ Callaghan, Carla (17 March 2014). "In pictures: Kids and their families protest to save Viewpark Glen". ^ Douglas Archives; accessed 31 August 2010. ^ "Viewpark honours football hero Jimmy Johnstone". Daily Record. Glasgow. 17 August 2011. Retrieved 4 January 2018.